At yesterday’s grand opening of the Berhane Selassie Art Gallery at Tuff Gong International, Minister of Tourism, the Hon. 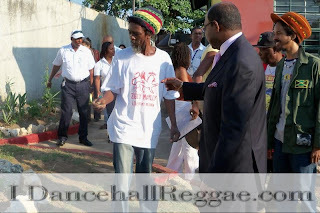 Edmund Bartlett, expressed his deep respect for the record company founded by the Hon. Robert Nesta Marley, OM. Artists who are featured in the gallery include seventeen year old Jamaican, Laura-Anne Fung, who did a splendid interpretation of Bob Marley as well as other abstract pieces. Joavan Puran’s half Haile Selassie I, half lion face profile was a crowd favourite at the opening as well as the ten-piece black history series done by Tennyson “Jimmy” Smith; both those artists are also Jamaican. Works by Switzerland-born Djamila Liniger-Strauss are also on display. The Berhane Selassie Art Gallery is located at Tuff Gong International (220 Marcus Garvey Drive) and has been included in the Making of Music Tour, a half-hour journey through Tuff Gong’s facilities allowing visitors to witness the process of making music from start to finish.